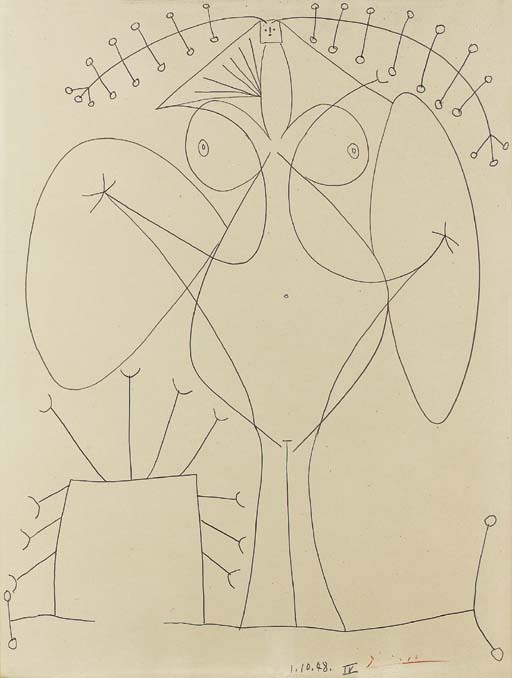 C. Zervos, Pablo Picasso, oeuvres de 1946 a 1953, vol. 15, 1971, no. 87, (illustrated p. 87). Femme fleur is a classic rendering of Picasso's lover Françoise Gilot, who had entered into the artist's life towards the end of the 1940s. With all of Picasso's women, their character and personality would inalterably influence and feed Picasso's stylistic development. As with Dora Maar, the eternal pleureuse, who would fall into fits of crying at the slightest prompting by the artist, Françoise will be remembered by art history as the Woman-Flower. Proud and self-confident, she took the longest to succumb to his advances, and was the only one to leave him in the end. As Picasso told her, "No, it's just not your style. A realistic portrait wouldn't represent you at all." He continued, "I don't see you seated. You're not the passive type. I only see you standing." (Picasso quoted in: "A Triangle of Ambitions: Art, Politics, and Family during the Postwar Years with Françoise Gilot", Picasso and Portraiture, exh. cat., New York, Museum of Modern Art, 1996, p. 418). And thus she stands proud and upright, as in Femme assise of 1947 (Zervos XV, no. 50, fig. 1), now in the Musée Picasso in Paris, her hair this time abstracted into, not the petals of the flower, but the stamen, as if ready for "pollination". Woman Flower became Picasso's "signature" portrait of Françoise, and he reputedly told her: "You're like a growing plant...I've never felt impelled to portray anyone else this way." (Ibid., p. 422).